Our community’s Memorial Day Ski to Sea event has been raced by my husband and I for many years. Eight-person relay teams start on Mt. Baker with cross-country skiing and downhill skiing, head down the mountain running and bicycling, take to the river canoeing, mountain bike into town and then cross the bay kayaking. The kids variously come along and cheer, or stay in town with friends and meet us at the finish. This year, we’re doing it all car-free. That means the folks who have mountain starts will bicycle 50 miles the day before and camp out, before getting up early Sunday to bike the remaining 10 miles to their starting positions. 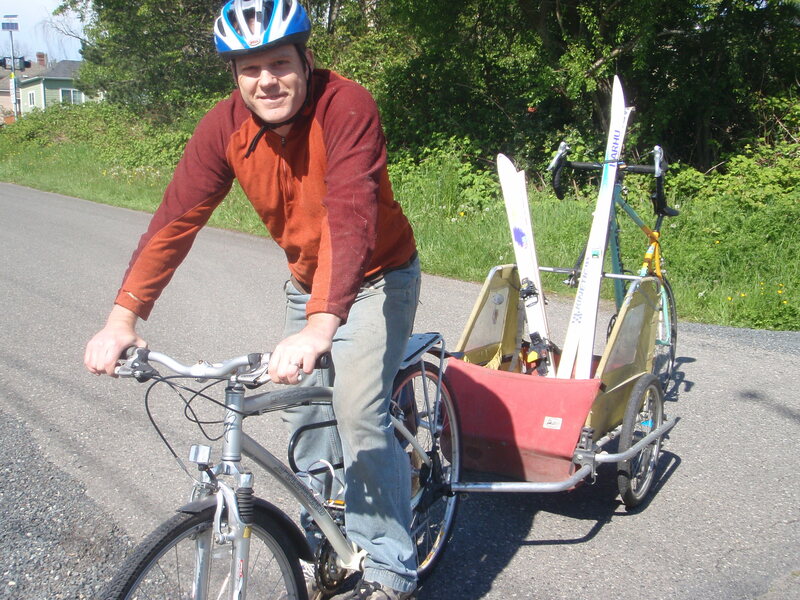 Tom’s our cross-country skier, and will be using our bike trailer to tow skis up and the runner’s bike down to her finish. There are lots of entertaining logistics – like bicycling the canoe 25 miles to their start – but we’re going to have fun with this. I’m mountain biking this year. That means 14 miles to the start on race day, 14 miles of racing, then a few more to the kayak finish. And on Saturday, I’ll be helping get the kayak into position which will include walking 3/4 mile from my house down to the water, and retrieving our kayaker by tandem bike after she paddles it to the start. We may even have the kids help with the logistics, biking between the in town legs with support gear. And in a few more years we can think about entering the family division. Or maybe they’ll have a car-free division by then. All I can say is wow! You guys continue to impress me with your creativity and limitless energy. We aspire to do half as much. Keep it up!